Bethan has been selected for the Award exhibition at the British Ceramics Biennial 2015, she will be making a new work entitled The Bridestones. Bethan is also showing in Many a Slip, Marsden Woo Gallery's Summer Show, guest curated by Alison Britton, which runs 22 July - 5 September. Bethan has been nominated by Alison Britton for the third Perrier-Jouët Arts Salon Prize. The prize began in 2013 and focuses on makers and artists who take inspiration from natural forms and organic structures. The previous winners were Hitomi Hosono and Laura Youngson Coll. Salon members - chaired by The Executive Director of the Crafts Council, Rosy Greenlees - will meet in March to make their selection for 2015. See more of Bethan's work here. This summer Manifold members Bethan Lloyd Worthington, Ellie Doney, Sun Ae Kim and Matthew Raw will be resident artists at Guldagergaard International Ceramics Research Centre for one intense week of experimental, collaborative making in their newly refurbished studios and grounds. Their time will culminate in an event in the Apple House Gallery on Wednesday 28th August, where they will discuss their approach and show work made in Skælskør. The Saltburn School and Kirkleatham Museum 20 March – 30 April 2013 at both venues Preview Evening with introduction by artists and commissioners 19 March 18:30, The Saltburn School. Bethan’s work for The Reveal is an investigation of the small, defined, but interconnected dig territory in terms of human and geological time. Bethan spent two and a half weeks with archaeologists and volunteers, walking in from Staithes most days. Pieces record specific details within and around the Street House site - Heather recolonising the alum mines and cliff tops; An incongruous boulder; A cut in the ground, proof of Romans; A tree, near a spring, where there was a farm, on former borderland, where gallows swung upon a tumulus. The light passing, the wind rocking the portakabin. It’s an attempt to communicate the experience of spending time with people who point at things that aren’t there and talk about them as though they are. At Kirkleatham Museum prints, objects and film by the artists sit alongside finds. At Saltburn School, a larger collection of drawings, photography and installation span two rooms and coincide with the launch of Saltburn School’s new Class 1 gallery. With thanks to archaeologist Stephen Sherlock, Arts Council England, Redcar & Cleveland Borough Council and Rednile’s Factory Nights. Bethan, Matthew and Hanne Mannheimer, are exhibiting in Forming Words, an exhibition at Flow Gallery, Notting Hill. The Show explores how text can inspire form and structure. Bethan's work Calendar has been selected by Vulpes Vulpes for their open exhibition Appropriate Response. VULPES VULPES is an artist-led group and project space which hosts exhibitions, performances, events and workshops in Clapton, East London. The project is not for profit and is managed and run collectively. Bethan has been taken on by Bearspace in Deptford. Selected works will be available through the gallery throughout 2012 and news of an exhibition will follow soon. Image: Pinnacle from The Wild Places 2010, pencil, watercolour, gouache. In late summer 2012, Bethan will undertake a residency at Street House Excavations in Loftus, North East Yorkshire, alongside archaeologist Stephen Sherlock and his team The cliff-top field has so far yielded extensive remains - from neolithic quern stones to a saxon female bed burial - and is a site of national importance. Bethan will be working alongside the archaeologists, responding to the site, finds and processes. The residency came about through Rednile's Factory Nights - Carefully encouraged accidents. Writer in residence at Jerwood Visual Arts, Chris Fite-Wassilak has written a lovely piece on Bethan's work for the JVA blog. Read it here. Image: Eel and spear from Wildeor 2010, High fired porcelain, hand-modelled and sharpened. Bethan has been selecteded for Town Hall Artworks 2012. 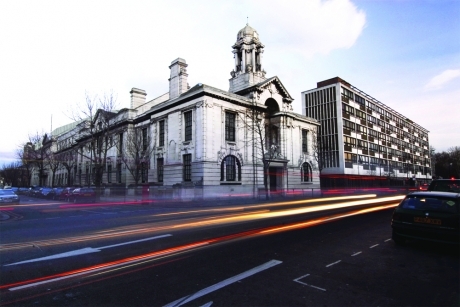 Working with Artsadmin, five star Town Hall Hotel & Apartments in Bethnal Green has commissioned a major series of artworks. Bethan will create a smashed-porcelain and brass sculpture called Constellation for the De Montford Suite and a glass piece spanning several fire doors called A Pace or Two Ahead of Us. Read more about the commissions here. *Stick-Up- the process of joining together two parts, in ceramic process. 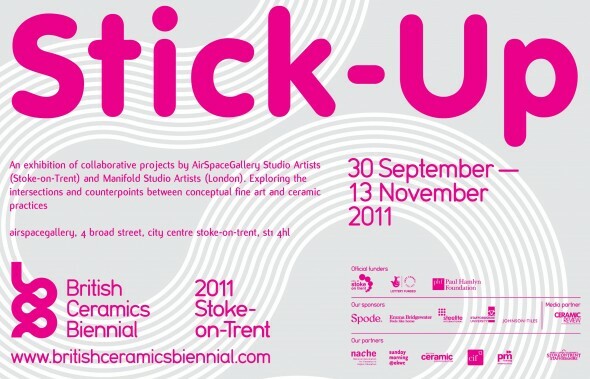 As part of the British Ceramics Biennial, Manifold are collaborating with Stoke-on-Trent's AirSpace Gallery and Studios. 30 September — 13 November Tuesday - Saturday 10.00am - 5.00pm Closed Mondays & SundayAirSpace Gallery and its studio artists work within a contemporary art context in different mediums. The intention is to instigate an element of risk for both the artists and curators. As both sets are removed from their individual comfort zones and work towards a challenging resolution. Our two studio groups collaborated to make a body of works within a restricted time period. The focus of the project is the exchange between two types of working methods, skill sets and knowledge. The outcome of these unpredictable investigations developed organically over an intensive three day period leading up to the opening of the exhibition, exploring a new found relationship between Ceramics and Contemporary Art. Artists: Zachary Eastwood-Bloom, Ellie Doney, Amy Hughes, Sun-Ae Kim, Hanne Mannheimer, Bethan Lloyd Worthington, Bejhat Omar Abdulla, David Bethell, Andrew Branscombe, Anna Francis, Janine Goldsworthy, Phil Rawle. See www.airspacegallery.org for more detailed information on the project and exhibition. Reclaimed City: Janine Goldsworthy & Amy Jayne Hughes Working without vision of a final outcome the collaboration took on a playful and experimental approach. Focus was placed on the process, conversations and enjoyable combinations, using different elements to make interesting visual consequences. It was important to use materials that had a connection to the local area, borrowed largely from businesses that developed out of a derelict environment that is now in the process of regeneration. The methods of working included sharing of skills and ideas as a departure from our normal artist practices by embracing the unpredictable and pushing limitations in unplanned creative constructions. The resultant artwork welcomed the transforma- tions of material and physical values. Components kindly donated by L & M Eurotrading LTD and PVR Scrap yard, Burslem. Reliquary: Bethan Lloyd Worthington & Anna Francis, Starting at the end. View the Project Blog. This is a reliquary constructed of engineering bricks. It was created to house relics excavated from the former ABC Cinema site next door. The relics were cleaned, examined and documented. They were then placed within the reliquary during building, in order of importance (most best to least best). Each one was marked on the exterior in chalk. The mark’s position indicates height and orientation. The first number is the number of the relic; the second is the depth, with the exception of No. 13, which was dispersed by smashing. Fairly quickly, at the beginning of this project, we identified two main areas of difference within our practices – Notions of permanency/ephemera in terms of materials and public/private processes of making. Gradually, we converged. When our conversation moved towards examining our homes and the things we surround ourselves with, rather than our work, we found common ground. Wall of Secrets: Phil Rawle & Ellie Doney got interested in clay’s ability to preserve and immortalise gestures, moments in time, fingerprints – the hand of the maker. The conversation turned to archaeological findings, and roman objects that Phil had seen, with inscriptions on them that turned out to be curses on neighbours, or invitations to a birthday party. We recognised that some of these mysterious tablets were actually quite mundane in content, the equivalent of status updates or tweets, perhaps a shopping list. They began looking at pictogram clay tablets in Sumerian cuneiform and Egyptian hieroglyphics, secret coded messages, communicating not deep secrets at all, but business accounts. What might people write in a coded inscription today? What are our contemporary secrets? A secret can be personal, or about someone else. A confession, something untold, something hidden, or something newly discovered. Inscribing one on a tablet in personal code may be a way of releasing it, or examining why it is a secret. Inscribing into clay realises them permanently, perhaps to be found years later. The artists want people to contribute to the piece on-site. We would like to provide an intimate space to think about what they want to represent. At the old Spode factory in Stoke, was found a simple worktable and lamp used for hand-finishing ceramics, which, when installed in the gallery, calls to mind the scribe’s bench, or the monk’s scriptorium. Limited Edition: Hanne Mannheimer & Andrew Branscombe Taking inspiration from the industrial decay experienced in many of the former potteries around the city the work looks at processes and mass production. Inspiration was drawn from the stacks of unfinished ware, machinery and individuality found in these sites. The artists first met while installing the BCB exhibi- tion at the former Spode factory. They took the opportunity to look around the derelict areas of the factory, which helped to form the method of working as well as a wealth of raw materials. The factory sites often contain equipment and machines unique to a particular process or person. Andrew created machines using found materials, which were suggestive in appearance of existing processes and equipment. Then without instruction the equipment was given to Hanne who intuitively used the creations. Both the tools and clay became flawed, impractical and limiting to the way of working, creating a range of mass- produced failures. Studies: David Bethell & Sun-Ae Kim Bethell and Sun-Ae’s work looks at the process in the ceramics industry particularly the value, mark-making and traditional influences used to design ceramics. The work sees the collaboration using drawing and mark making as their primary source, testing symbols and imagery used from different times, including contemporary and 18th century drawings. The initial concept for the studies was to look at courtship, romanticism, history, and the new. This resulted in a series of studies that translated these influences into mark- making and design. This later lead to the work being developed through the value of the object and questioning the current value of ceramics today, against easy and cheap materials such as paper plates and cups. The use of paper plates and cups also acted as maquettes for the potential development of the works into more refined designs.